The historic Indian city of Agra, best known as the home of the Taj Mahal, has a long and illustrious tradition of carpet weaving. Although the weaving industry in Agra was limited, its workshops produced graceful antique carpets, recognized for their superb artistry and excellent workmanship.  Antique and semi-antique Agra carpets, as opposed to modern “Indo” rugs, are highly sought after, ranking among the finest of decorative Oriental carpets. 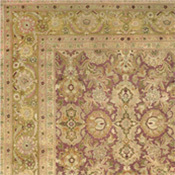 An elite group of the very finest 19th-century Agra region carpets is attributed to the town of Amritsar. These are known for their extremely fine craftsmanship, extraordinarily lustrous wool, and highly artistic designs and color combinations. The most prized antique Amritsar carpets show very clearly drawn and spaciously placed designs, often based on “Garden of Paradise” themes. 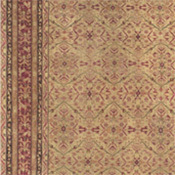 Large Amritsars are quite rarely found and are highly sought after for their grandeur and decorative impact. 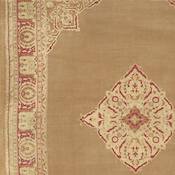 Weaving in Agra dates to the founding of the Mogul Empire in India in 1530. The Mogul emperors were deeply affected by Persian art and culture, especially Persian carpets, in what is called “The Golden Age of Persian Weaving”. Their art sought to replicate the beauty of the Persian court where the first Mogul Emperor had spent time in exile and to which the later Emperors remained connected. The resulting “Mogul” carpets were masterworks of creative endeavor which are the forebears of antique Agra carpets still available today. In 1584, the Third Mogul emperor, Akbar the Great (1556-1606), established his capital at Agra, where his grandson, Shah Jahan, was to build the Taj Mahal. Surviving records from Akbar’s reign speak of royal patronage of antique carpet weaving, with Persian craftsmen being invited to India to help establish the carpetmaking industry. These records speak glowingly of the high regard with which Agra or “Mogul” carpets were viewed. 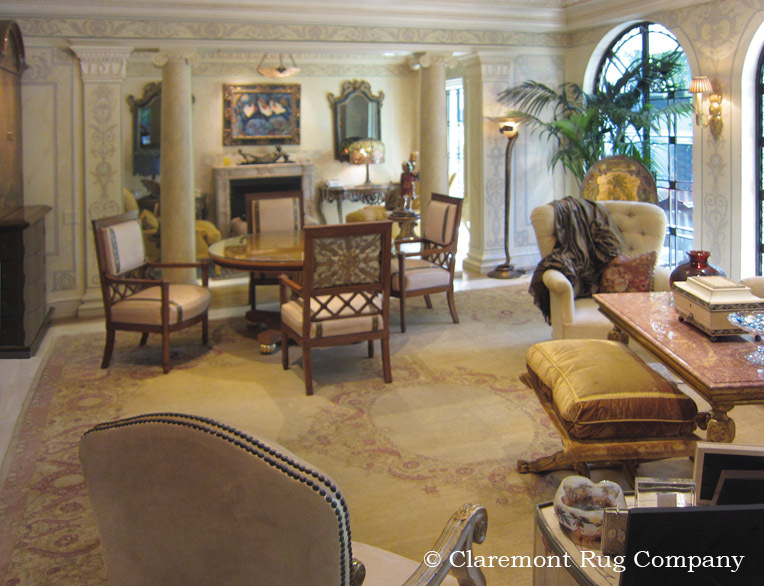 Agra carpets combine the grandeur and grace of well-known Persian court antique carpet designs with new motifs of their own creation. Overall designs of spiraling vinery are frequently combined with small animal forms, sometimes including birds, elephants or people. 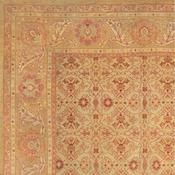 A very famous Agra carpet design, developed for the Mogul emperors, consisted of rows of flowers in vases. This design was, in turn, adopted by the Persians and can be found in floral Persian carpets. The artistic “cross pollination” between Agra and Persia continued until the end of the nineteenth century. The weavers of Agra were masters at vegetable dyeing and developed a unique palette of color. 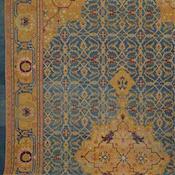 Soft mid-tone blues and a profusion of golds are often found in Agra carpets. They also use a range of soft rust-reds to pinks and a unique and appealing lavender tone. 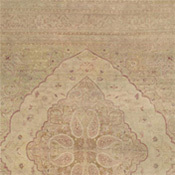 These colors give many Agra rugs a light, ethereal appearance which is stunning in the home. 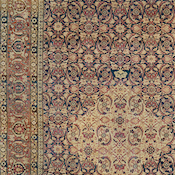 The Agra rugs produced in the early 20th century are often of a commercial nature, and lack the quality and inspiration of their earlier counterparts. 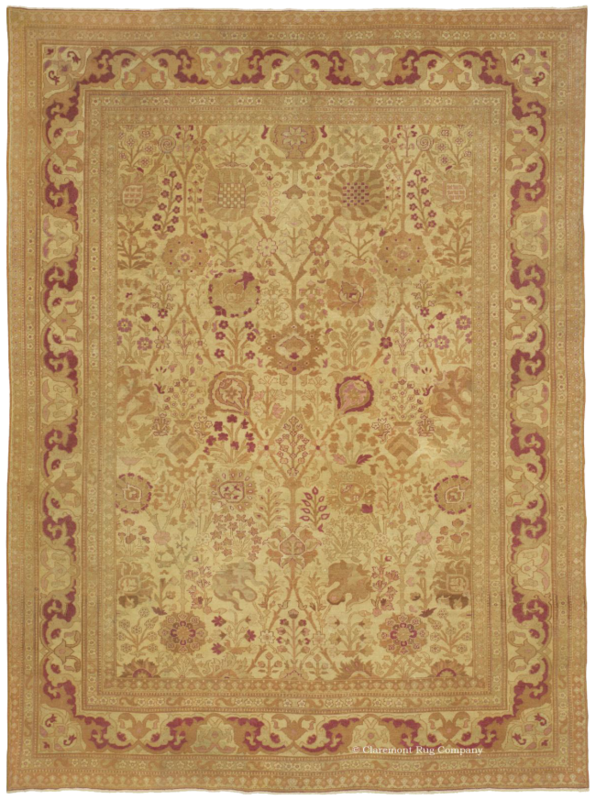 However, the finest 19th-century Agra antique carpets are universally respected by both collectors and interior designers, and are to be considered as individual and highly praised works of art, whose delicate palette of color and whimsical drawing is unique among decorative antique carpets. 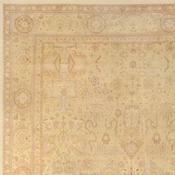 Undoubtedly, the cream of the 19th-century Agra carpets will continue to appreciate as superb art investments.